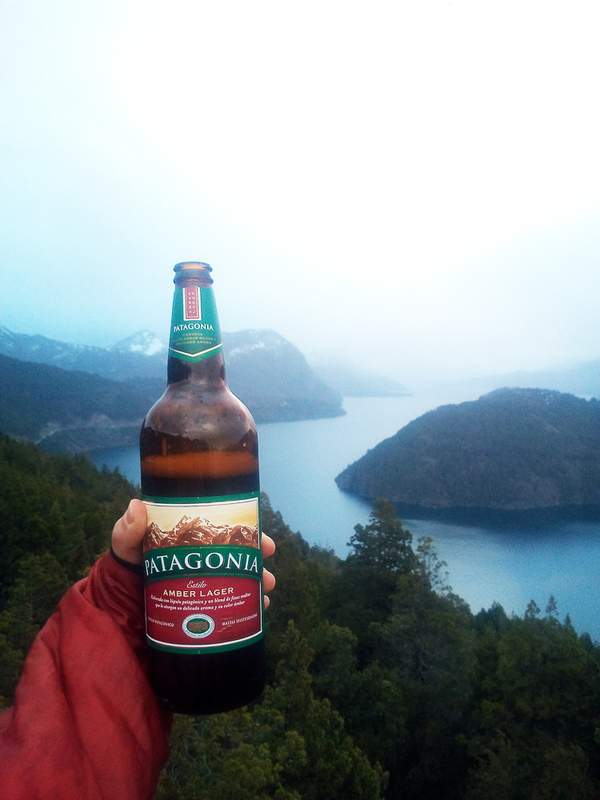 After finally drying out from all the wet snow that we’d found in Chile, we set our sights on Argentina. San Martin de los Andes was the next stop; a lovely ski town surrounded by the typical Patagonian landscape made of forests, hills and big lakes. 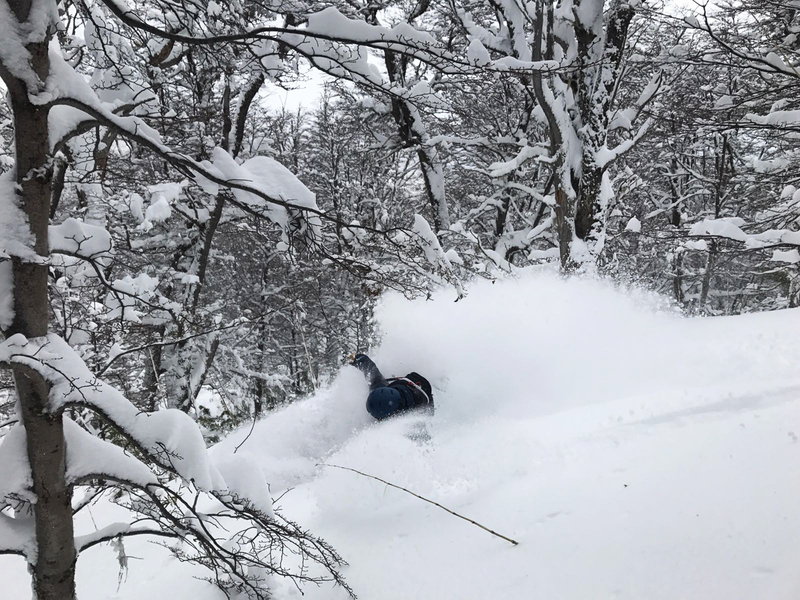 The only Argentine stop of the FWQ was held above San Martin, at Cerro Chapelco, a sweet ski resort with a relatively good infrastructure. Once again, we were disappointed to find that the zone in and around the resort was flat. But when we saw the contest venue, our minds changed. After reaching the top of the lifts, we looked down the other side of the final ridge. Here, we found the back bowls which offered lots of possibilities to choose from steep, and steeper lines. After finishing our inspection, the unpredictable humid Patagonian weather hit us once again, and the competition was on hold. Obviously, we took advantage of this and got ourselves a proper taste of local culture, which consisted mainly of Fernet* & Coke, some cumbia* music, and the resulting headaches. In order to counteract the hangover, some local skiers showed us the tree runs. It didn’t stop snowing, so we spent our time focused on face shots and pillow runs, even though the terrain was relatively flat. On contest day, we found the Back Bowls covered in a perfect layer of 50cm fresh snow and strong sunshine. The stoke was in the air and all the finest Chilean and Argentine riders were present, as well as a decent mix of Euro and Gringo* competitive ski bums. I had worked nearly all night to memorize my line but shortly after dropping in and feeling comfortable on my first turns, I failed to stomp a big drop, and tomahawked all the way down. I did at least five flips, and I must admit that it was fun, even if it wasn’t what the judges were looking for. My friend Ana was more successful, taking the win with a run full of cleanly stomped cliffs. The general riding level, and especially the level of the female riders, was surprisingly high for a 2* event. Everybody wanted to go big rather than go home, and the show was impressive. 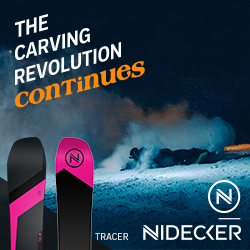 After a couple of days of riding with other ski bums in San Martin, we decided to head to the famous Cerro Catedral resort above Bariloche in order to finally set up our splitboards for bigger missions. 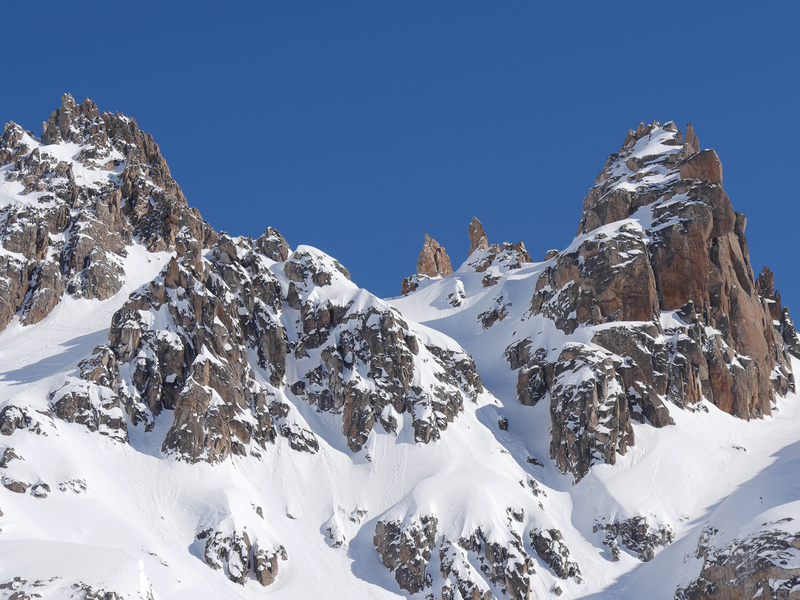 Our main goal was a visit to the Refugio Frey, a mountain hut surrounded by a crown of granite towers and a variety of couloirs that make even experienced alpinists salivate. On our way to Bariloche, we picked up Swiss freeride skier, Tamara Nef, who had just arrived from a sand-ski film shooting in Peru. Understandably, she was eager to ride some proper snow. 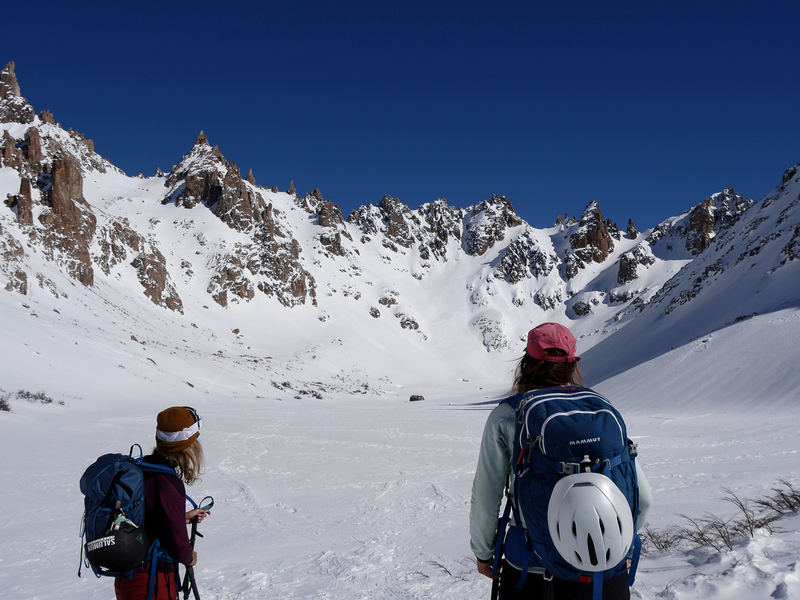 The girl gang was complete and ready to hike and to clean up those couloirs. One of the departure points of the hike to the Frey hut is located at the very top of the ski resort Cerro Catedral. After shaking off some random Argentine skiers who thought that it was too dangerous for three girls to adventure into this terrain, we finally started skinning. We were all excited to sleep in a hut, but very shortly after starting, my splitboard skin broke and we had to abort the trip. The overnight in the hut was exchanged for an Argentine chocolate fondue from downtown Bariloche, which was absolutely not bad at all, from the perspective of two Swiss girls. My skin seemed unfixable, but just before desperation set in, luck came back to me. The owner of our hostel turned out to be a real McGyver, and actually fixed the unfixable. So off we went to Refugio Frey on the first morning bus the next day. Many people had spoken to us about this place in the past, but in reality, it was above all of our expectations. A cute little hut close to a frozen lake and surrounded by granite towers, creating a surreal sight. And in between those towers, plenty of possible lines to be found. We only had one day to make it back to town since a storm was coming in that evening, so the three chicas chose the big couloir of the Tres Marias. Happy surprise on the top: no tracks in there. 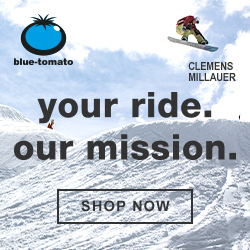 We delighted ourselves with the fun that pachamama had very generously offered us and skinned back to the hut, rode down, skinned back up to the ski resort, slalomed down between working pisten bullies, and caught the last bus to town…. where a huge plate of the finest Argentinean meat was waiting for us. What more could we ask for? 1- Fernet: Fernet Branca is an Italian herbal alcohol, but for unknown reasons it became the number one drink in Argentina. It’s usually mixed with Coke. 2 – Cumbia: Cumbia is a music style, widespread throughout Latin America, with a specific rhythm structure. Every country has its own cumbia, and at every Argentine asado, you will find those rhythms stuck between your ears. You may even learn to dance, with the help of Fernet or Pisco. 3 – Gringo: From a South American perspective, an English speaking foreigner or North American. Some would argue even Europeans are gringos, but I wouldn’t make this official.